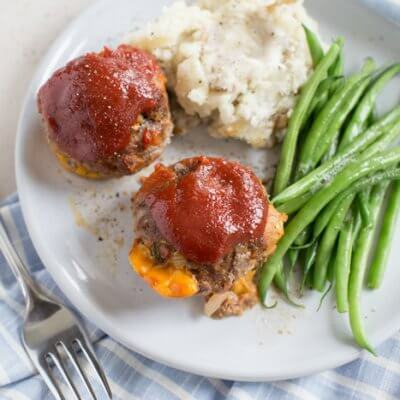 Cheesy Meatloaf Minis made in the muffin tin and full of hidden veggies. Freezer friendly, family friendly weeknight meal that’s gluten free. Preheat oven to 350 degrees F; coat 12 count muffin tin with cooking spray or oil. Over medium high heat, sauté onions, bell pepper and garlic until translucent and fragrant. In large bowl, gently mix together cooked onions and bell pepper with beef, carrots, zucchini, cheese, bread, tomato paste, egg, and seasonings. Roll mixture into 12 small meatloafs and place in muffin tin; bake for 15 minutes. In small bowl, mix together sauce by combining maple syrup, mustard and tomato paste. Add tablespoon sauce on top of each meatloaf and broil 5 minutes.